"We don't let acts of cowardice like this deter us. We are, if anything, even more vigilant and even more determined to tell this important story"
A noose was found inside the Smithsonian National Museum of African American History & Culture, and U.S. Park Police are investigating. Tourists found the noose Wednesday afternoon on the floor in front of a display about the KKK inside an exhibit on segregation, the Smithsonian Institution said in a news release. "The noose has long represented a deplorable act of cowardice and depravity -- a symbol of extreme violence for African Americans. Today's incident is a painful reminder of the challenges that African Americans continue to face," museum director Lonnie Bunch wrote in an email to staff. Park police removed the noose and closed the museum for about an hour while police investigated. "We were leaving the segregation gallery. We were walking through and then the guard came up and said, 'Everybody out! Everybody out!' So, they rushed us through, and at the time we were not aware of what was going on. We just knew we had to leave that area immediately," tourist Tracy Grant told News4. "It's very hard. It's very very very upsetting,"
"We were very emotional to begin with. This is history. This should not be happening in this day and age." "It's very hard. It's very, very, very upsetting," she said. "We were very emotional to begin with. This is history. This should not be happening in this day and age." An impromptu gathering of supporters outside the museum Thursday drew Bunch out to speak to them. "Thank you for helping us go through what is really one of the most difficult times we've had as a professional, because we know this is not just a symbol,” he told them. 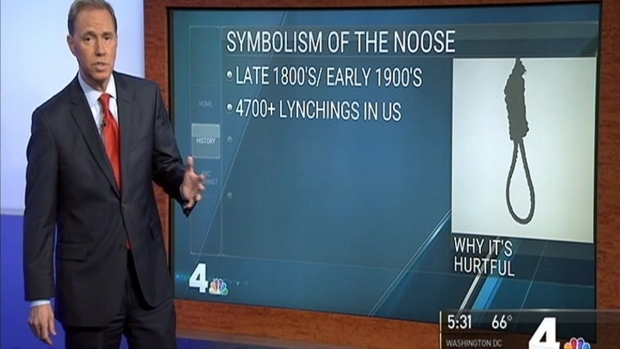 “This is about the noose symbolizes loss, pain. It symbolizes a country that we don't believe in, but your rallying around us helps us remember what a great place we can be when we come together." Visitors left red roses at the reflecting pool. "And what I love is look at the faces,” Bunch told News4. “It's America at its best. Unbelievably diverse. It's a group of people that help us remember what America can be." The Rev. G. Vincent Lewis, visiting the museum from Atlanta, said the discovery of the noose is a reminder that hate still exists. "Still, we’ve got to deal with folk trying to suggest that we're not equal to other American citizens because of our color,” he said. “That's tragic." But he's not sitting down. "We really need to, in protest of this, rise above it and let the people know who would try to do this that we're not going back there," he said. Staff from the National Museum of the American Indian joined the supporters. "That sort of thing is not welcome here, and we are not afraid of you," National Museum of the American Indian Director Kevin Gover said. 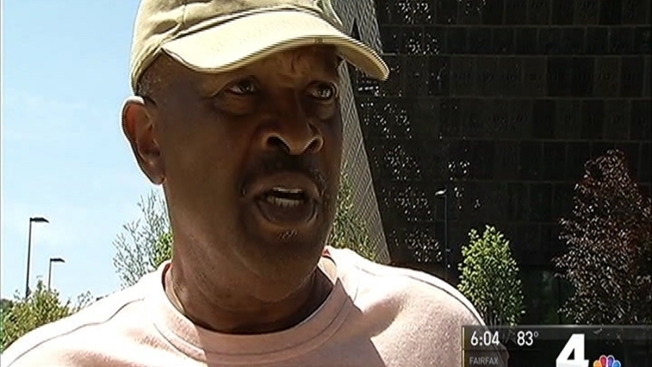 The Museum of African American History & Culture said it has cameras in the area but didn't comment on what images it captured. The noose was found less than a week after another noose was found on the National Mall, hanging from a tree outside the Hirshhorn Museum and Sculpture Garden. Kinshasha Holman-Conwill, the African American museum's deputy director, said the mission of the museum continues. "We don't let acts of cowardice like this deter us. We are, if anything, even more vigilant and even more determined to tell this important story," she said. In its release, the Smithsonian Institution cited several similar incidents that have recently occurred across the country. "Other nooses have been found on the Duke University campus, the Port of Oakland in California, a fraternity house at the University of Maryland, a middle school in Maryland, and at a high school in Lakewood, California," it said. "All of them seem to be part of a larger wave of violence, intimidation and hate crimes." The noose was used as a symbol of racist intimidation on the campuses of American University and University of Maryland. Here's a brief look at the history of the symbol. On Thursday morning, the museum was operating as usual.